How do I change the font on my invitation? 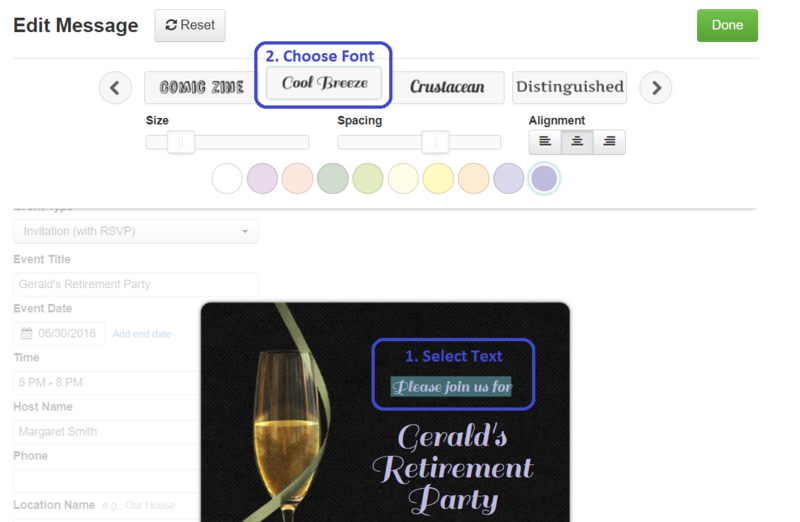 You are able to change the font on your invitation from the Design step. On the Design & Details tab, click the Edit Message button to reveal the font and other formatting options available. To change the font, first, highlight the text you'd like to update and then choose your desired font. To change the size of the font on your invitation in the mobile app, tap on the line of text you'd like to edit and then tap on the + or - buttons to increase or decrease the size of the text. To change the typeface of the font on your invitation, tap on the line of text you'd like to edit and then tap on the F button and choose the style of typeface you'd like to use.